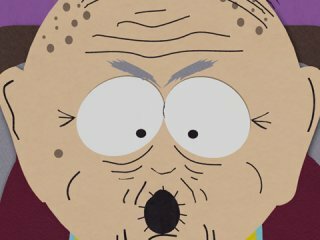 South Park Episode 106 - "Death"
"Happy Birthday" to Stan's Grandpa Marsh who just turned 102. How does the wizened Mr. Marsh feel about his birthday? He sums it up in five words; "I wish I were dead." and proceeds trying to end his life enlisting Stan to do it for him. 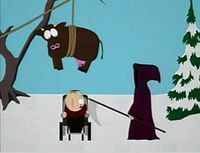 However, Stan is aware of a very important thing if he kills his grandfather, he'd be in trouble, and if he's in trouble he can't watch Terrance and Phillip.